"I was very relieved when Phil declared the radio dead". Blakeley, F. Dream Millions. 65. Much has been made of the modern equipment the first C.A.G.E. 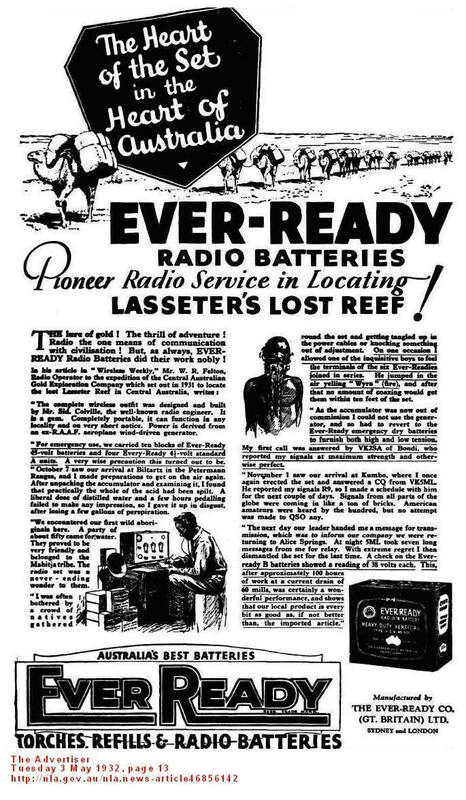 Expedition carried in the search for Lasseter's Reef, in the particular the radio transmitter/receiver that would be used to communicate with the Company in Sydney and in case of emergencies. When Coote was interviewed by the Barrier Miner on 20/07/30, he added that the expedition would use the radio to contact Arthur Blakeley in code when the reef was found, so that Blakeley, as Minister for the Northern Territory could prevent, "ill equipped parties rushing to the field with all its dangers from thirst, blacks and starvation". The radio was given its first tryout when the Expedition camped for a couple of days at Dashwood Creek, there it was discovered that the radio would only receive and not transmit. Apparently some vital components such as the speaker and several valves were missing, making the set partially inoperative. According to Coote the purchase and operation of the radio was Lasseter's responsibility and an acrimonious argument followed, between Lasseter and Taylor, regarding Lasseter's competence and ability to operate the equipment. Lasseter persevered with the radio and while fiddling around managed to fuse part of the set. Lasseter eventually got the receiver working and the first reception was the cricket scores from the 1930 Ashes tour of England, broadcast by Radio 5CL Adelaide. This pleased the Captain who was a keen cricketer, The Expeditions Aboriginal guide, Micky, was introduced to the wonders of modern communications, Idriess writes, "They put the earphones on Micky, seated on a box, he submitted with a grin, anticipating anything might happen. Something did. Statics! Micky bolted". Coote's more believable account has Micky amazed at the contraption and puzzled over the connection between the ariel, the truck and the radio. Far from being terrified Mickey became a radio enthusiast and without his tree climbing ability to string the aerials the Expedition may not have received the signals they did. Blakeley intended to keep tight control of radio communications, he had been warned of the possible consequences of other parties listening in on the Company's messages and misinterpreting or taking advantage of any information transmitted, especially with manipulation of the share market. while waiting at Illbilla, for Coote to return from Ai Ai Creek, Lasseter persisted in trying to get the radio working, and continuously gave out the Company's call sign and S.O.S's. Blakeley was angered to the point of threatening to put an axe through the radio unless it was packed away, "then I will be sure that you won't be monkeying with it while I am away". There's an inference that Blakeley had suspicions that Lasseter and Coote may have tried to pull a 'stunt' with false communications and after the Illbilla incident the near useless radio was not used again. The radio cost about 100 pounds, and according to Blakeley was a remarkably complicated piece of equipment to assemble, and was not worth the money paid for it. The radio was sold for ten pounds in Broken Hill, like much of the Expeditions equipment it proved a failure and Pastor Albrecht at Hermannsburg makes the pertinent comment, "The preparations in Sydney were anything but thorough, otherwise they would not have accepted a transmitting set without testing it before packing it up for the expedition". Blakeley, F. 23,24,29,61,64,65. Coote, E. H. Hell's Airport. 81,82. Idriess, Ion. L. Lasseter's Last Ride. 23,38,61. Albrecht, F. W. Letter to Lutheran Almanac. 1964.